Snake plants (Sansevieria spp.) are notable for their extreme hardiness. Also called mother-in-law's tongue, these plants are easy to grow, according to Colorado State University Extension's website, and rarely suffer from insect pests or diseases. The vertical, twisting leaves can be variegated or striped, depending on the cultivar and thrive in containers. For these reasons, they are often grown as houseplants. Although hardy, snake plants can suffer from conditions that yellow and curl the leaves. Snake plants can be cultivated indoors. It is usually the tips of the leaves that first turn yellow. This may be followed by slight curling of the tips, which occurs when that part of the leaf dries up and dies. The plant may also seem to be suffering a slight overall decline, such as wilting or fading of the variegation in the leaves. The causes of leaf yellowing in snake plants are environmental. The plants are tropical in nature, so temperatures near freezing can kill parts or all of the leaves. This can happen outdoors or when an indoor plant touches a cold windowpane. Water can play a factor as well. A lack of water will cause the plant to dry out, with the leaves turning yellow from the tips downward. Too much water can cause root rot. The roots become infected with a fungus and the plant slowly dies. In fact, this is the primary cause of death in snake plants, according to the University of Illinois Extension website. 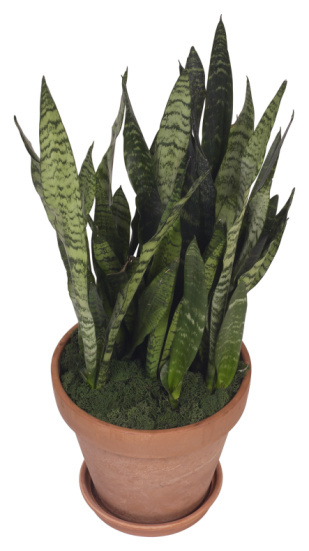 In general, snake plants should be watered when the soil is barely dry to the touch during the growing season and only every other month in the winter. Keep your snake plant healthy by keeping it in warm conditions and by controlling the amount of water it receives. Snake plants also thrive in bright but indirect light, as direct sunlight may scorch the thick leaves. The roots spread quickly but the plants enjoy being pot-bound. Still, repot the plant every two years or so to prevent the roots from becoming severely crowded. If you notice just a few of the leaves turning yellow and wilting, try tugging on them gently. If they pull easily out of the soil, the roots are rotted away. In that case, you can pull off the rotted leaves and repot the plant's remaining, healthy leaves or prop the leaves up with a layer of sand placed around the base of the plant. Some cultivars of snake plants have naturally yellow and curling leaves. Sansevieria trifasciata "Twist" features leaves with yellow borders that twist and turn as they grow. Sansevieria "Golden Hahnii" also has leaves with yellow stripes on the edges.